While this card is face-up on the field, it cannot be Tributed. 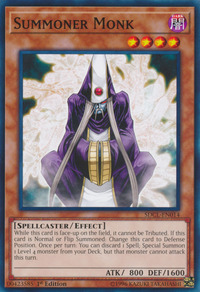 If this card is Normal or Flip Summoned: Change this card to Defense Position. Once per turn: You can discard 1 Spell; Special Summon 1 Level 4 monster from your Deck, but that monster cannot attack this turn. If a monster like "Dark Ruler Ha Des" or "Revived King Ha Des" destroys a monster by battle, then the monster's effects are no longer negated if the monster leaves the Graveyard. Thus, if "Summoner Monk" is destroyed by battle with "Dark Ruler Ha Des" and is then Special Summoned from the Graveyard, then its effects are no longer negated, so it may Special Summon a Level 4 monster from the Deck. : After Summoning a monster which was destroyed by battle with "Dark Ruler Ha Des", if the monster's effect activates, then is it negated?